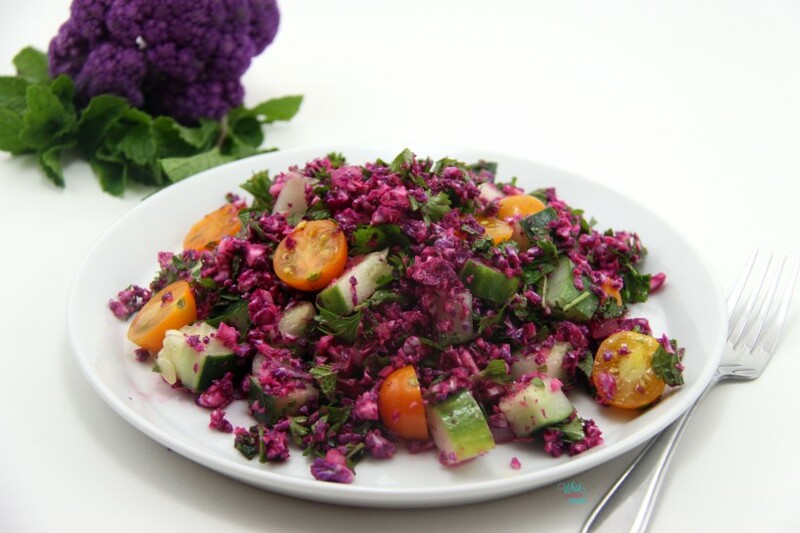 Add a pop of color to your plate with this Colorful Cauliflower Tabbouleh! While at the famer’s market a couple weeks ago I came across the most beautiful head of purple cauliflower. I was memorized by the color and I wondered what I would do with it but wasn’t sure. I than noticed that my nails were almost the same color purple and thought forget flowers, which was one of the only things I really planned on getting that morning, I was going to get that cauliflower. 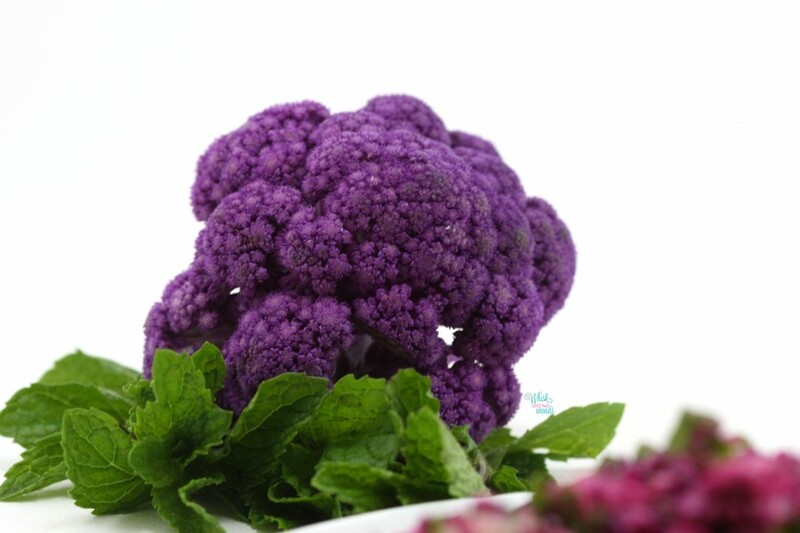 It also reminded me of how much A loved purple cauliflower, or any of the colored ones, but she got so excited when she was younger when we found a purple one. It was a much lighter purple and not nearly as dark, rich, and beautiful. We made a Purple Cauli-Power Smoothie with it, besides eating it raw for snacks. We walked around the market, my friend and I got a 25 pound bag of beets, which I ended up with most of! Yep as I write this I still have to figure out what to do with those. As well as some golden beets, juicy plums (I had no idea we had Minnesota grown plums but will also be looking up that farm), and some ground cherries. I had never had ground cherries before but they were tasty and I thought the girls would like them. I had planned on making something with those but we have been poppin’ them like candy, nature’s candy. So back to the beautiful head of cauliflower. I had to make something worthy of it’s beauty. I decided I wanted to make a colorful chopped raw salad and since I was still thinking about some of the Mediterranean, Greek, and other dishes we had on our vacation I decided to make a version of Tabbouleh. I had all the herbs, cucumber, and some beautiful orange cherry tomatoes all growing in the garden. So fresh and full of flavor and COLOR! Once I added in the extra virgin olive oil and lemon the color of the cauliflower bled a little resulting in a beautiful magenta color. Add in the fresh herbs and orange cherry tomatoes and the salad just popped! It was almost to pretty to eat but oh man this was definitely one that tasted as good as it looked, nourished my body, and had me feeling amazing! Like they say nothing like a pop of color, even when it comes to your food! *To make cauliflower rice clean cauliflower and cut florets off. Pulse florets in a food processor until it resembles the texture of rice. I use my small food processor and do it in a couple batches. In a large bowl combine cauliflower rice and chopped red onion. In a separate small container combine lemon juice and oil, I like to shake it in a glass jar with a lid. Pour lemon juice oil mixture into the cauliflower and mix. Stir in parsley and mint mix until combined. Toss in the cucumber and tomatoes and generously season with salt and pepper. Serve immediately. 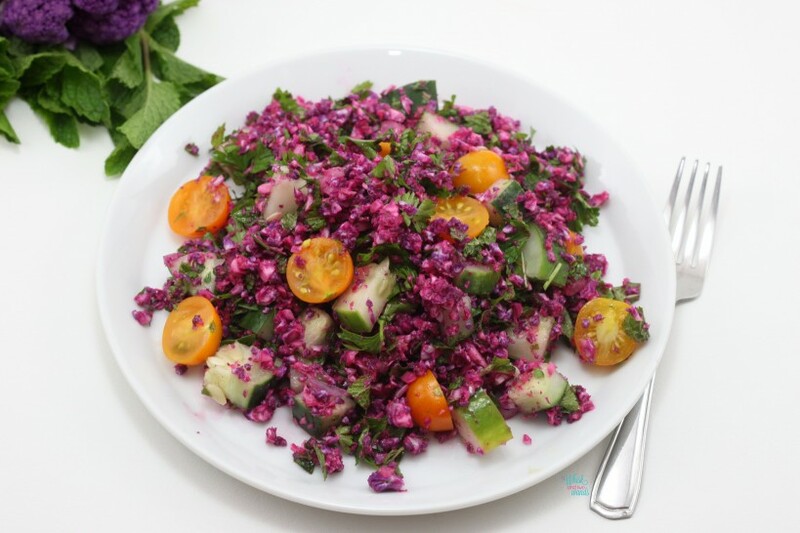 Leftovers can be stored in an airtight container in the refrigerator but this salad taste best within a day or two as the cucumber and tomato start to soften and the herbs start to oxidize. Enjoy! 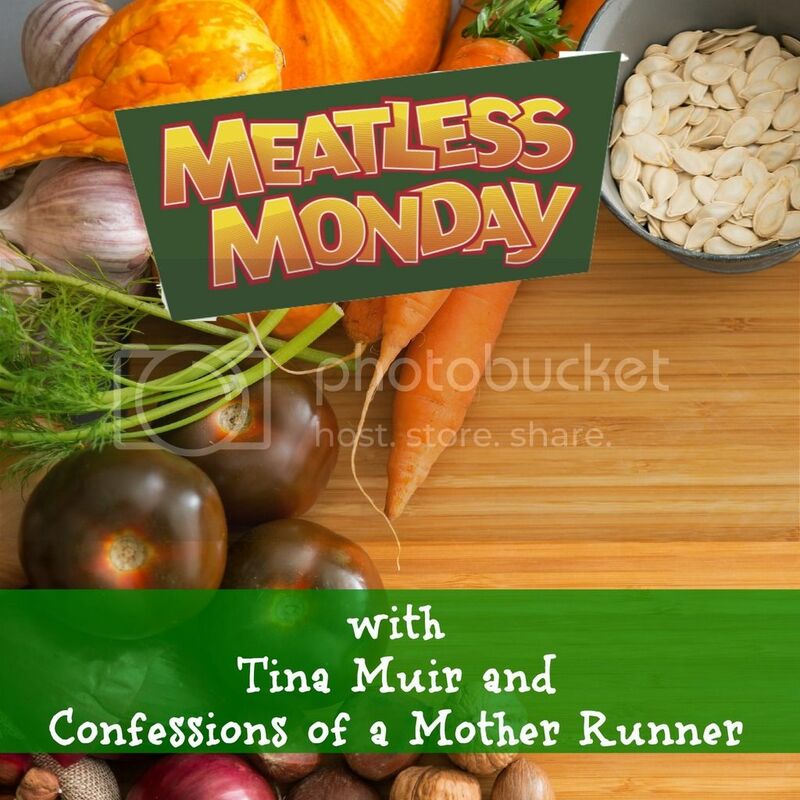 For more Meatless Monday inspiration click the link below to see what fellow bloggers are whipping up this week! Yum this is a keeper! I love tabouleh and how creative to use cauliflower rice in there. Thanks for linking up with us today! Thank you, I love when food looks as good as it tastes! Yes you must add it to your list! 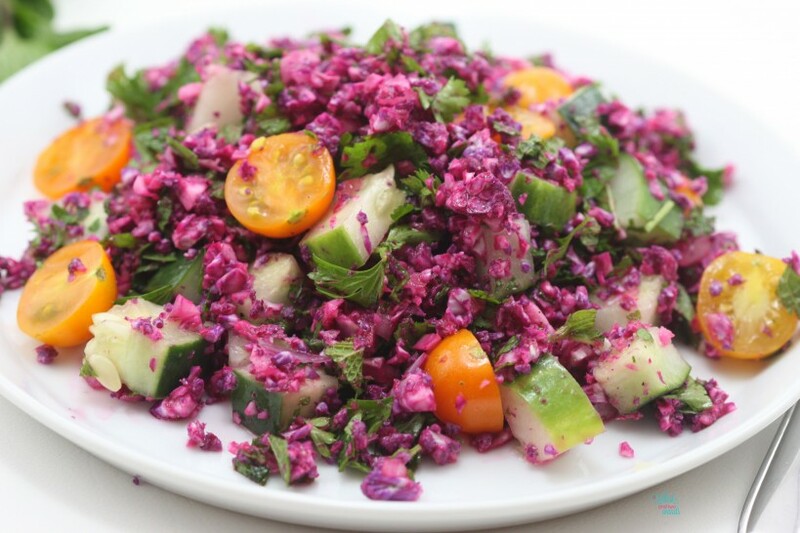 You would sure get your dose of color with this salad! Thank you! Yes very colorful, it would look beautiful on any table. 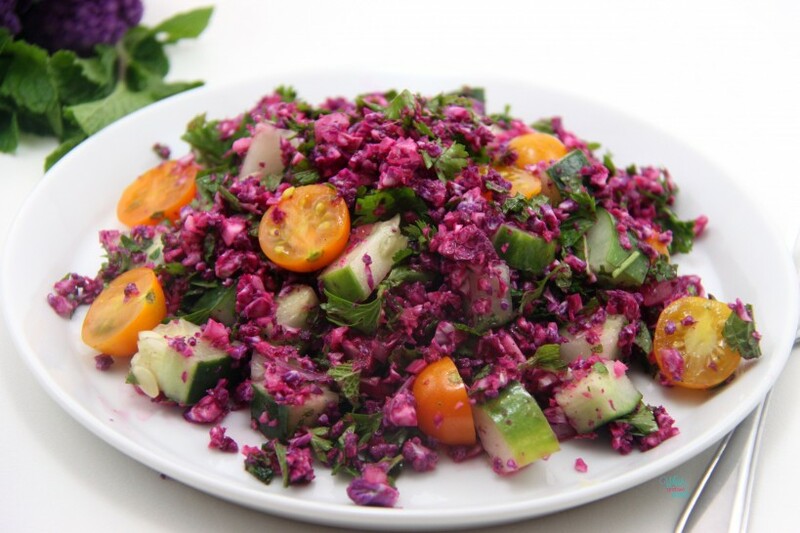 Oh my gosh, I love cauliflower and tabbouleh! I will have to give this a try! Thank you, hope you enjoy it as much as I do! WHOA! Now this is super creative and AWESOME!! 😀 I must try this! GiGi Eats recently posted…Give Me Some Sugar, Sweet Lips! Thank you it’s full of color, flavor, and nutrition a must try for sure! Oh I so need to make purple pizza crust for girls night! Thank you, hope you enjoy it!